As national Republicans ramp up the pressure to force Roy Moore to drop his Alabama Senate campaign, the small group of local GOP power players who will ultimately determine Moore’s political fate are taking reluctant steps towards deciding whether to cut him loose. The 21 members of Alabama’s Republican Party central steering committee are the only ones who can pull Roy Moore’s nomination and potentially block his path to the Senate. After days of mounting allegations that their Senate nominee had sexual contact with teenage girls while he was in his 30s, two Alabama GOP sources tell TPM they’ve finally decided to hold a meeting later this week to hash out whether they can stand by his side. “We are still weighing the evidence, but realize some decision or statement must come from the state party soon,” said one Alabama Republican. Most members of the committee have so far stayed silent, worried about fury from Moore backers if they reject him and damage to their own political careers no matter what they do. 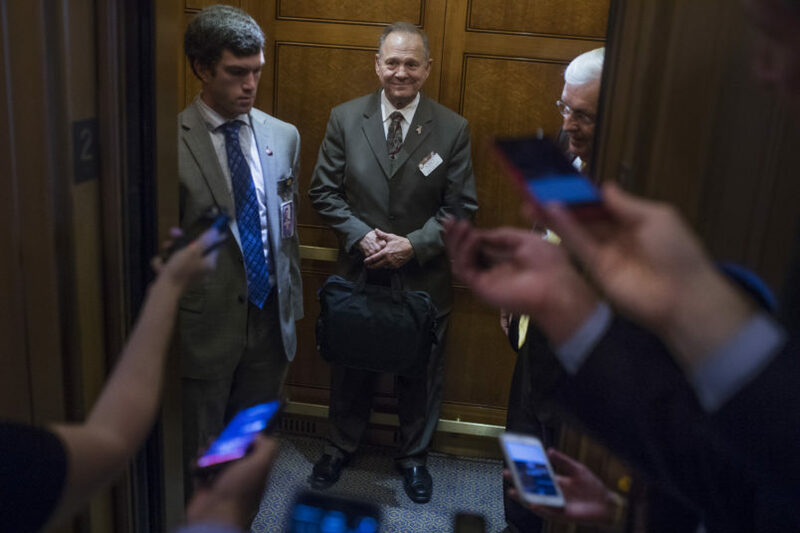 But as the allegations pile up against their nominee, they’re creeping towards making a decision on whether to stand by Moore or pull the party nomination and back a possible write-in campaign, a move which further dims their hopes of holding the seat. Under state law, it is too late to remove Moore’s name from the ballot or replace him with another candidate. If his nomination is withdrawn but he still gets the most votes in the Dec. 12 election against Democratic nominee Doug Jones, it’s unclear what happens. Some interpret the law as saying the election would be null and void and the governor would need to call a new one, while others say the second-place finisher would be declared the winner, whether that’s Jones or a write-in. Lawsuits would be likely. 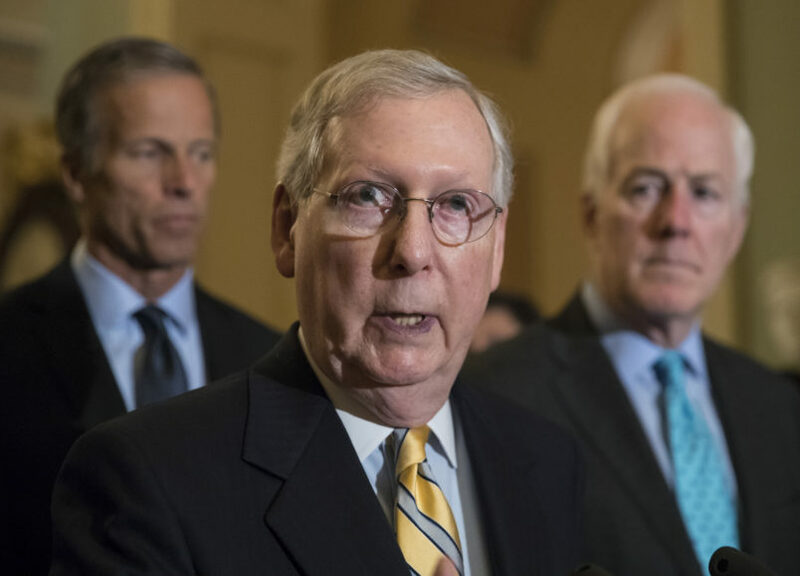 National Republicans moved swiftly against Moore on Monday, with Senate Majority Leader Mitch McConnell (R-KY) unequivocally calling on Moore to quit the race and National Republican Senatorial Committee Chairman Cory Gardner (R-CO) saying the Senate should vote to expel Moore if he does win his election. “The women looked believable and the stories looked believable,” Sen. Richard Shelby (R-AL) told reporters Monday, calling the accusations “very disturbing” and repeating his suggestion that Moore should drop out of the race. Shelby and other Republicans buzzed about possible write-in candidates. But two of their most obvious options seemed to take themselves out of the running on Monday. Two sources close to Attorney General Jeff Sessions said he’s told Alabama Republicans he’s “not interested” in returning to the Senate seat he gave up to become attorney general. Session’s appointed successor, Sen. Luther Strange (R-AL), who lost to Moore in the GOP primary, told reporters Monday that it’s “highly unlikely” that he will run. Alabama Republicans said there’s almost no chance of Moore stepping aside, even if more accusers come forward — and even if President Trump himself calls for Moore to drop out in the coming days. Moore is famously stubborn, has long clashed with establishment Republicans in the state (including some on the steering committee) and has twice been forcibly removed from the state Supreme Court for refusing to follow the rule of law. “It doesn’t matter what the party does. It doesn’t make a difference. He’s not dropping out, look at his history. He’s been forcibly been removed from office twice. He wants to be martyred,” another senior Alabama Republican told TPM. Despite the seriousness of the allegations against Moore, state Republicans face a no-win situation politically. They can yank a nomination Moore won fair and square in the primary in spite of heavy opposition from the party establishment, infuriating his die-hard backers who hold significant sway in the state party and face severe blowback and accusations that they’re rigging the game. Or they can stand by a candidate whose toxicity is damaging both the state and national Republican Party and causing deep embarrassment for the state of Alabama. The party is split heading into the high-stakes meeting. Some have finally had it with Moore, worry about more allegations, and want to see him drop out of the race immediately or lose the state party nomination. Others are furious at what they see as a concerted effort by establishment Republicans, Democrats and the media to destroy Moore’s life along with his political career. “It’s just politics. Donald Trump had to go through the same thing,” Perry Hooper, the Trump campaign’s chairman in Alabama, who’s not on the committee, told TPM. Others privately disagree — some of them vehemently — but the pro-Moore voices are louder and more aggressive. “I’ve heard they’re going to have a call this week. But let’s be honest: I don’t see them doing anything,” an Alabama Republican who dislikes Moore and has talked to a number of people on the steering committee told TPM. Many on the committee have their own political careers to worry about. Roughly a quarter of the committee’s members are running for public office next year and face competitive primaries where they need backing from Moore’s supporters. Others depend on GOP contracts for their livelihood, or on relationships built through the state party for company business. Further complicating the situation is the current disarray of the state party, which has been wracked by multiple scandals. Alabama Gov. Kay Ivey (R) assumed office just months ago after former Gov. Robert Bentley (R) was forced to resign under an ethics cloud. Attorney General Jeff Sessions, the state’s most powerful Republican, can’t get publicly involved because of his current position. Strange is a lame duck after losing to Moore in the primary. Sen. Richard Shelby (R-AL) is the only elder statesman left in the party — and he has little sway and even less trust with the state’s hardline conservatives, who challenged him in a primary just two years ago and were furious he backed Strange over Moore. Alabama Republican Party Chairwoman Terry Lathan didn’t answer multiple phone calls requesting comment, while party Executive Director Harold Sachs refused to discuss the party’s approach to Moore when reached by TPM. Lathan told AL.com Monday that it was “very unlikely” Moore would lose the party’s endorsement. But the state’s smart Republicans know something must be done — even if they don’t want to be the ones to do it.